← Twilight: The death of the vampire genre. A few days ago I started thinking about how much I love sci-fi. I mean, it’s one of those things you start watching as a little kid and it just grows on you, but in a good way of course. When it comes to sci-fi there’s the ever present debate that lingers in the background like an invisible elephant. That invisible elephant’s name is Star Wars VS Star Trek. One is better than the other. The other’s better than one. Before I continue though, I should like to let it be known that I’m a huge fan of both franchises, having grown up with them both from an early age. Star Wars bed-sets and Star Trek on tv. So when I give my 2 cents on which of the two is by far greater, know that it comes from a place of complete and utter respect for the creators of both franchises. Here’s how I look at it.. Star Wars is the epic story of good and evil, light and dark, beginning and ending… in a way. It’s spawned its own niche in the world of geekdom. It exposed us to new worlds, new creatures, new ways of thinking about the universe and our place there-in. We saw massive star destroyers, laser pistols, Han and Greedo (Han shot first.) and of course the Jedi and the Sith, without whom the epicness of Star Wars would be… greatly diminished to say the least. Star Wars is so iconic that it’s even spawned a religion. : Jedi. What other film franchise can say it’s done as much? And of course the best things about the Jedi(of film and literature) are the Force, and the Lightsaber. I mean, the ability to move objects with a thought, control the mind of a person, do major flips and of course wield a weapon with a blade of pure energy that cuts through basically every solid material known to man and alien alike. If that’s not awesome then what is? Now coming over to Star Trek we have a totally different reality. We still have starships, massive and small… and somewhere in-between. We still have handheld weapons that fire energy which is always awesome. There’s also warp speed and all the technological advances of the oh so far off future. The story told here is of mankind and its journey throughout the stars to learn more about itself and the universe in which it lives. That in of itself makes for an interesting story. Then you add into the mix the personalities of main captains of the franchise and those around them. It draws you in, that’s for sure. There’re even basically all powerful beings (the Q) who can do anything they want at any time they want for basically any reason they want, but who still have short-comings in one form or another. There’s more to both Star Wars and Star Trek than what I’ve mentioned of course,both have scenes that just grab you and refuse to let you go, but it’s far too early in the morning for me to prattle on too much more than I already have. 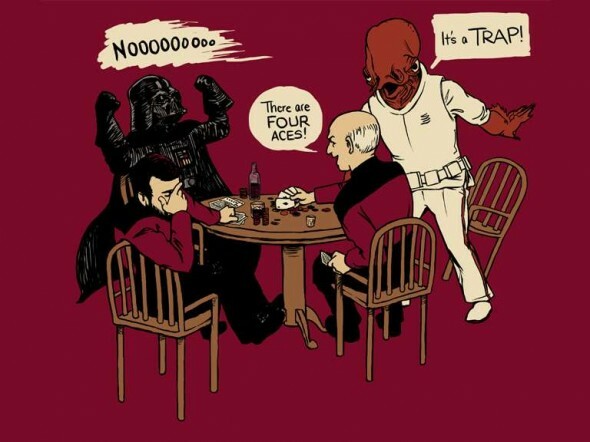 When one verses the other it’s clear to me that neither Star Wars nor Star Trek is better than the other. That’s right… neither one. They’re both amazing in their own rights. If you were expecting a completely and utter biased opinion on the topic I’m sorry to tell you that all I have for you is disappointment.